Why Does Slash Always Wear a Top Hat? NEW YORK (CBS/AP) Ever wonder why Slash wears a top hat? If the British guitarist is to be believed, it's because he's shy. In a recent interview with the Associated Press, the Velvet Revolver co-founder said of his trademark hat, "You can pull it down, pull your hair down over your face and just sort of hide behind that." "I've always been a little nervous in front of crowds," he added, "and that made it - made me - feel a lot more comfortable." 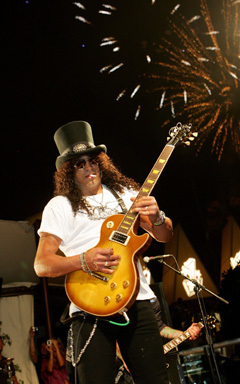 The former lead guitarist for Guns N' Roses, Slash told the AP he has always been partial to hats but the top hat dates back to 1985 when he was touring with Guns N' Roses. "I went into this in store on Melrose (Place) in Los Angeles and saw a top hat, and was like, 'Oh that's looks cool.' And we had a show that night," he said, "so I was definitely looking for something to wear for the show that evening." He said he managed to "nick" the hat and he decorated it with pieces cut from a conch belt he had stolen from a store next door. And - voila! "I wore it for that show and it just became the hat I felt really cool in."